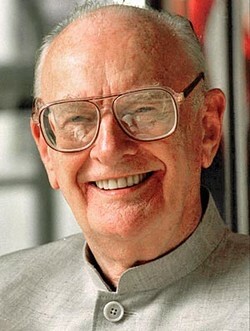 Sri Lankabhimanya Sir Arthur Charles Clarke, CBE, FRAS was a British science fiction author, inventor, and futurist, most famous for the novel 2001: A Space Odyssey, written in collaboration with director Stanley Kubrick, a collaboration which also produced the film of the same name; and as a host and commentator in the British television series Mysterious World. For many years, Robert A. Heinlein, Isaac Asimov, and Arthur C. Clarke were known as the "Big Three" of science fiction. Clarke served in the Royal Air Force as a radar instructor and technician from 1941�1946. He proposed a satellite communication system in 1945 which won him the Franklin Institute Stuart Ballantine Gold Medal in 1963. He was the chairman of the British Interplanetary Society from 1947�1950 and again in 1953.